I see these artisitically photoshopped Tumblr photos everywhere. Maybe you’ve seen them too. They typically appear as a pleasant nature snapshot or a map with the words ‘wanderlust/adventure/explore/______’ written on top of it in a carefully selected typeface. I can’t lie, it’s quite effective. Images like these have the power to remind me that exactly where I am on the planet, is simply not good enough – which is exactly the opposite of what is true, living on the beautiful Northwest Coast of Canada. 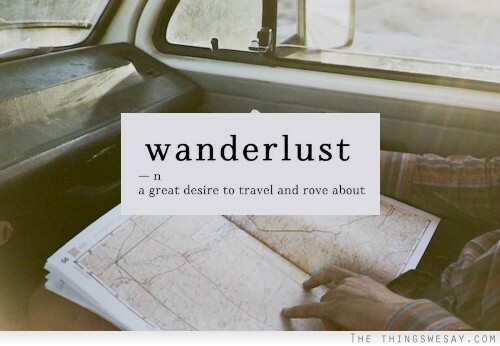 I solemnly admit that have fallen ill to Wanderlust. I like to think I’m just starting to get my wings and notice that there is a word outside of the small town I grew up in. Dat higher education combined with experience. If you asked my some of my friends with an Asian background, they would say that this is an attitude that is more common among white people. Take note that this is a generalization, and is obviously not always the case. It’s more of an anecdotal observation of the white culture I come from. I asked my roommate who is a Canadian from Hong Kong whether his is true and she admits that it depends who you talk to. Amérique du Nord: The capital city of the overpopulated state of Consumerism. the cameras flash to create the advertisment and propaganda for these billions of things. Travelling, in my opinion, is one of these billions of things. Wanting to see the world is natural! It’s good, in fact! We should want to explore our planet and learn new things. I pity the person who never wants to leave their comfortable bubble. some truths need to be expressed about catching the Wanderlust Bug, before setting off to wherever you’re going. It’s also what I’m currently in the process of doing. I’m sure if you’re trying to leave wherever you are, you have also arrived to this conclusion. Travelling simply is inaccessible unless you have money to spend. Gas ain’t cheap, especially to fly planes over an ocean or two. It requires a lot of planning and often a lot of sacrifices to save the money needed to get there. Homesickness was probably the first thing you thought of when you read that heading. But there’s much more to it than that. When you go to new places, chances are, you will love them. The language, the people, the culture. All of it is new and fascinating. But most likely you have to leave that place to return home. That goodbye can be excruciatingly painful, even when you’re ready to leave. The culture shock is often worse when you return to your home country and have to adjust to the familiar things. Familiar things sometimes hurt when you’re dreaming of a far off land. My theory is that when you go to a new place, you share yourself with that place and you even leave a bit of yourself behind. The more places you see and get to know, the more you leave bits of your self all over the world. This is wonderful, but it also makes it hard to be happy at home because there’s some part of you elsewhere on a different continent. The experiences you share in these different places is often not shared with many people when you come back. After an intense immersion of cultural depths it is hard to come home and have nobody understand what you have just endured. The more you travel, the more people you know elsewhere (which is amazing!) but the less you can connect with the people at home. For those people who dream of moving to a foreign country and fantasize about finding a hottie local girlfriend/boyfriend while you’re there, it sounds dreamy, but if you’re not staying for long, you may be missing out on the country and preparing for a broken heart. The majority of the world population does not have the affordances to be able to explore. It is a privilege to be able to hop in a car, bus or plane and completely change GPS coordinates for a while. It must not be taken for granted that the mere possibility of travelling is a blessing in itself. If you can’t tell, I have found myself jonesing to travel and wander the world, and I’m trying to lay out the facts so I can see them, and others can see them too. I’m learning quickly that wandering is not as easy as looking at a map and falling in love. A very seductive way of thinking that requires a lot of cash, a strong heart, and an unshakable sense of home and belonging.